Also, known as the Tennessee Sweet Potato. 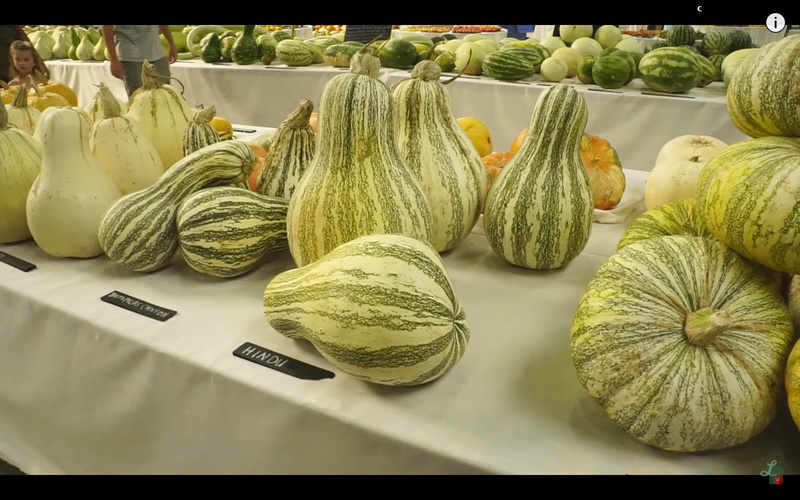 Fruits are pear-shaped with a crookneck. 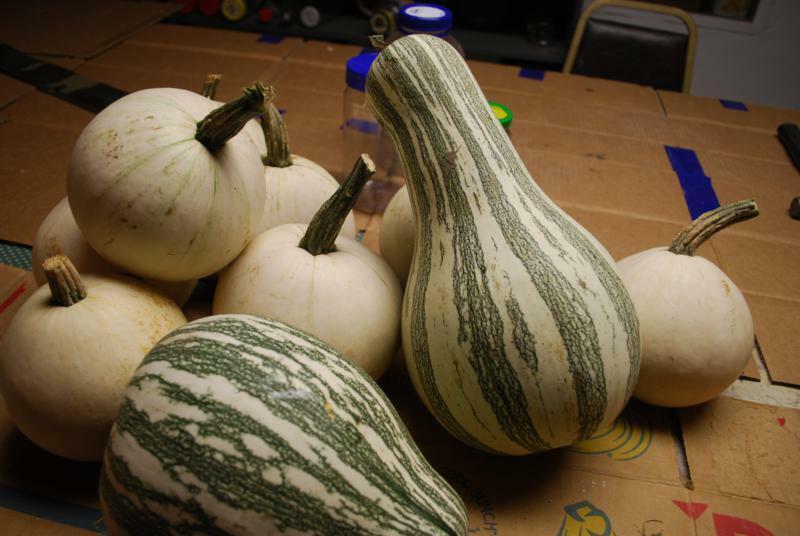 Flesh is pale yellow, thick, medium coarse with the sweet Cushaw flavor. This has long been a southern favor for gardeners. 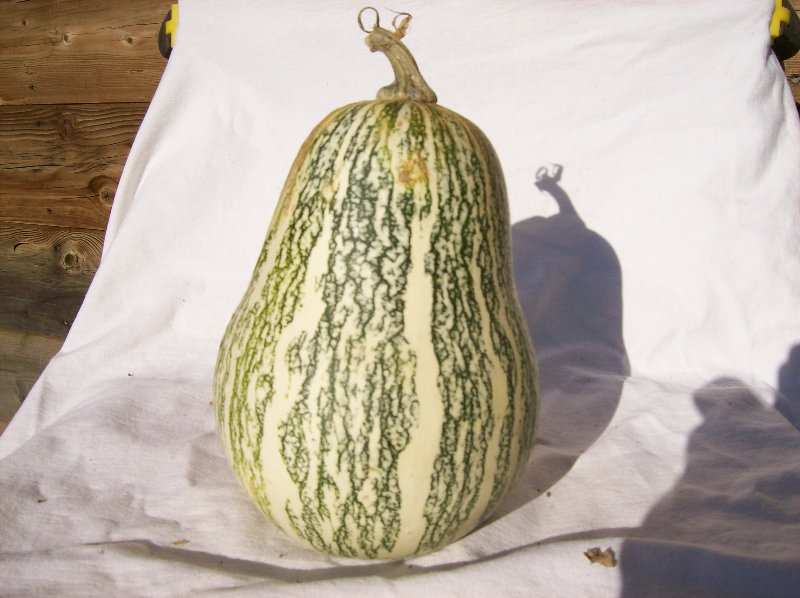 The green-striped Cushaw�s large, vigorous vines are resistant to the squash vine borer, which kills other squash and pumpkin plants. 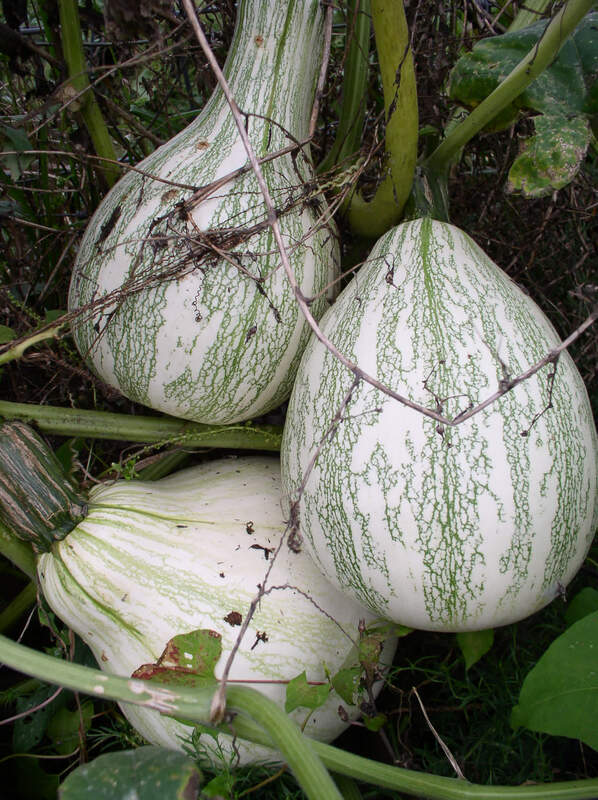 Large, bilobal to necked fruit are mostly green and white striped with somewhat thickened stems and occasional corky ribs. From the bottom of Batopilas Canyon in the Sierra Tarahumara, Mexico. But grows at low elevation in the hot deciduous forest zone. 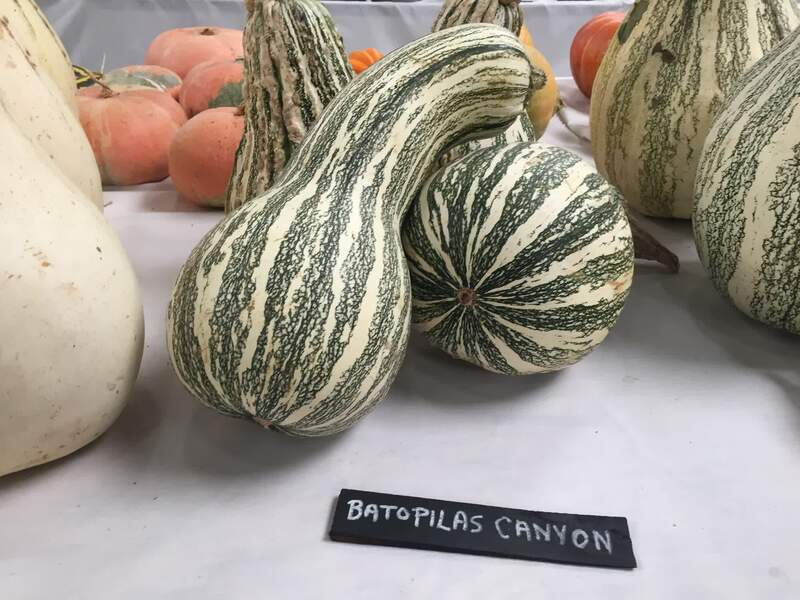 Also called Mexican Squash. Variable sizes, shapes and color of fruits with thick, flavorful yellow flesh. From Ures, Sonora (Mexico) at about 1500 feet elevation. fruit: Light green striped with yellow. Pear shape. 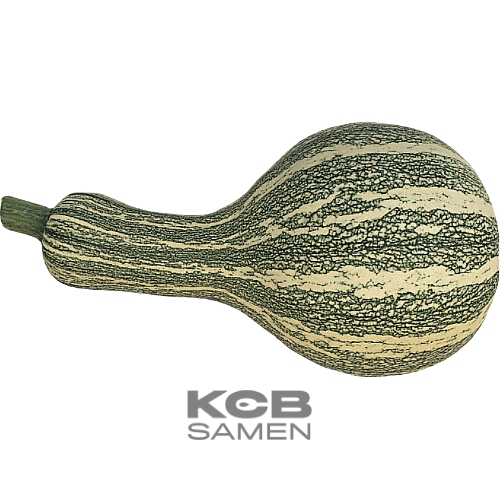 fruit size: 18 to 28 cm in diameter. Length 25 to 45 cm. weight: 4 to 10 kg. epidermis: Smooth and tender. flesh: Yellow. description / information: Variety of delicate culture. It offers 2 to 6 fruits per foot. growth: 130 to 160 days. 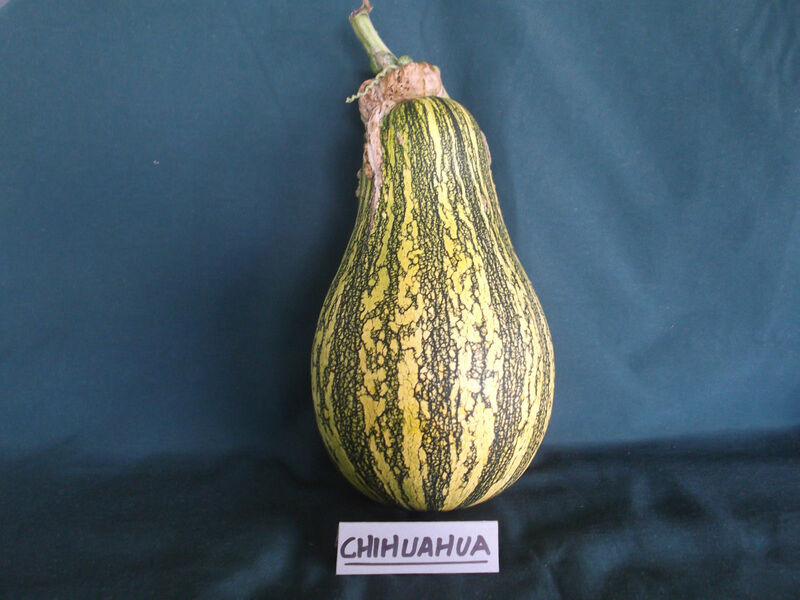 Chihuahua is a pumpkin variety originating from Mexico. It is very popular in the north of the country and the city of Chihuahua. It's shape can vary from roundish to pear shape, but both versions have smooth green rind marked with yellow and cream. Both versions also have a thick stem which grows down over the rind and gives the appearance of lava flowing from the top. The yellow flesh is firm, medium sweet with a good flavour. The small to medium length, thin vines produce good fruit numbers in a bit over 100 days. Once mature, the rind becomes rock hard, which would make them a wonderfully long keeper. 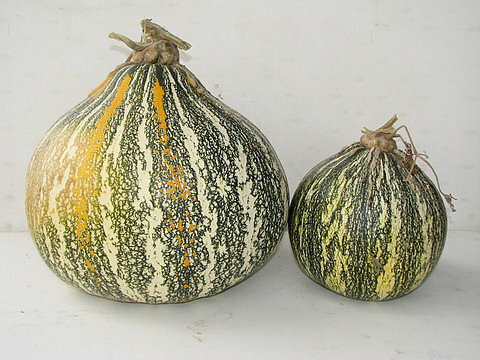 An egg-shaped squash grown for its silvery seeds. 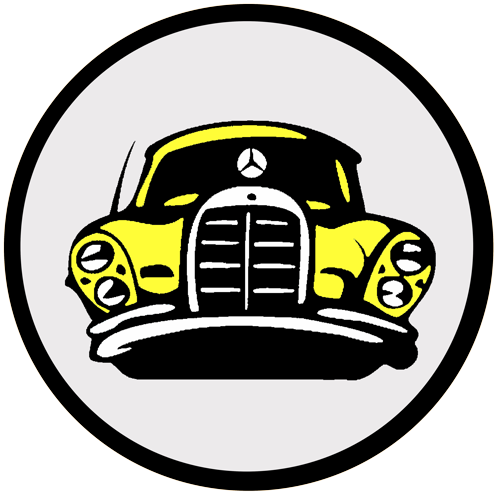 Can also be pure white or white with gold stripes. 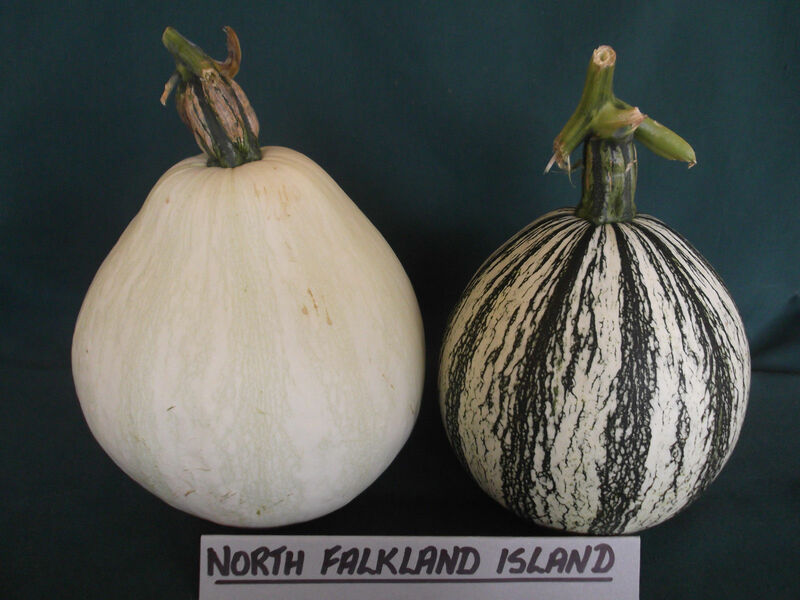 This is an amazing heirloom pumpkin variety from the North Falkland Islands. This variety produces 2 distinctly different looking fruits- The first is round to pear shape with a creamy white rind with occasional yellow marking and the second is similarly shaped with rind with greenish yellow markings. Amazingly, both fruit have virtually the same flesh-light yellow colour, fairly thick, firm, dryish, mild but tasty flavour. The medium size vines produce fruit ranging from 1kg to 2kg in 100 days. Whilst the vines can be grown together and will successfully cross pollinate, each vine will produce fruit all the same colour, not some of each colour. 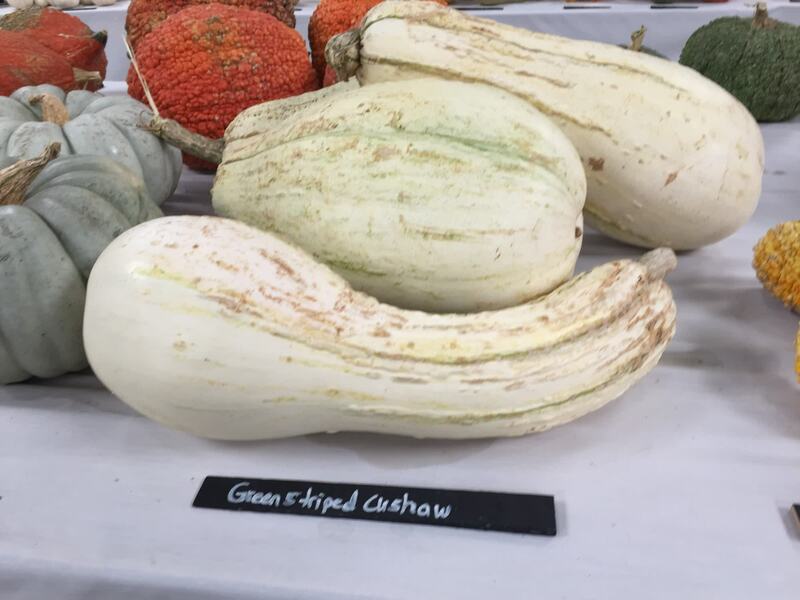 Cushaw type fruit without a large neck originally from Chimayo, New Mexico. 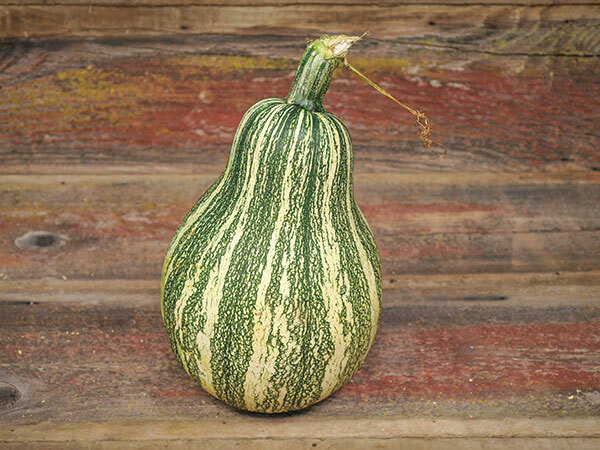 Vines produce green and white striped winter squash that turns orange when mature. 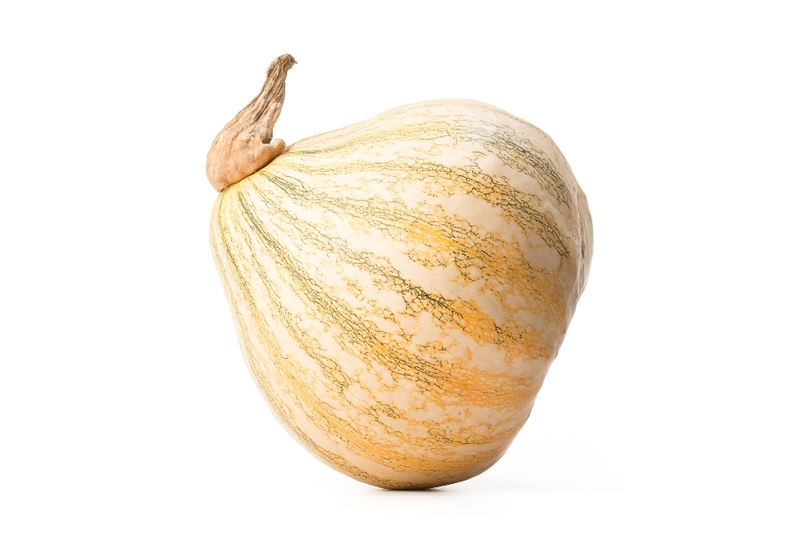 A winter squash, but great as a summer squash, and has loads of edible flowers and seeds. Seed review: Utah, United States- This one has grown tremendously here with hot days and cool nights. 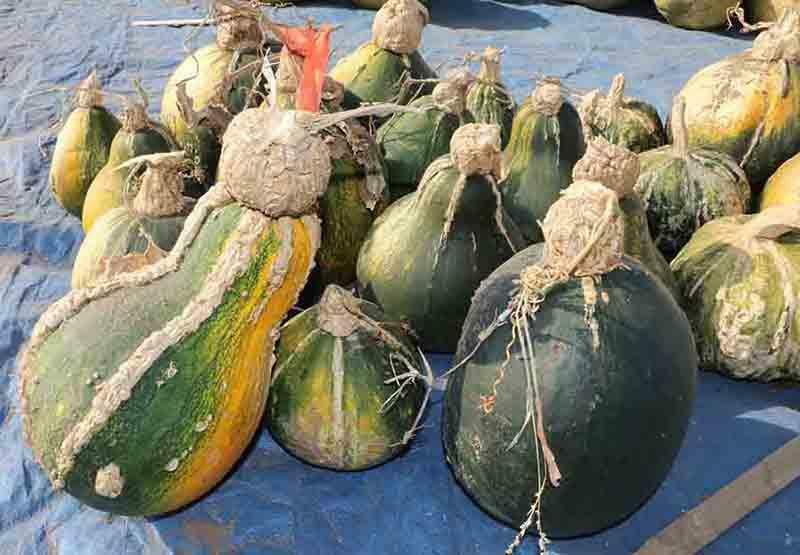 It is productive, vigorous, and the immature fruits are tasty as summer squash. It has perhaps the largest running vines I've ever seen. 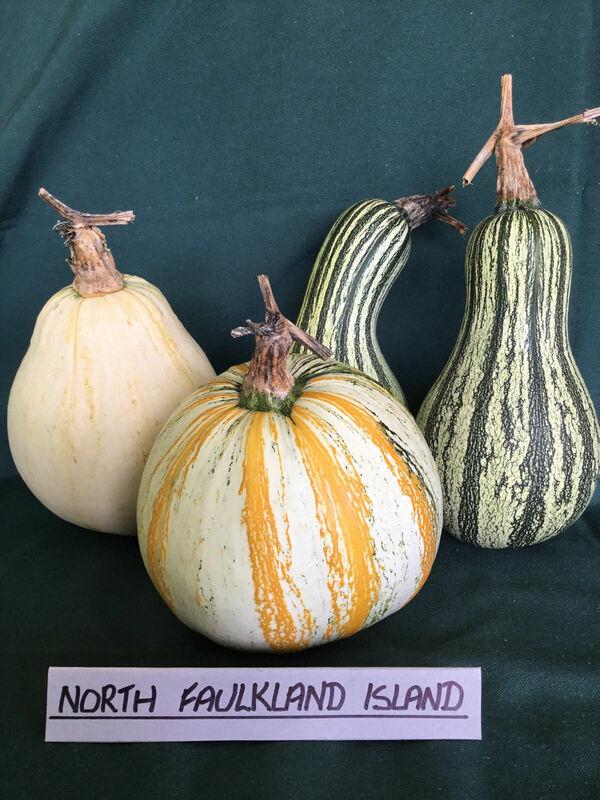 There are more squash than with other cushaws (except one - North Faulkland Island, which is not edible). I've used it as a summer squash and have used the flowers. Will update the mature taste and seeds. Well I never ate the seeds or the mature flesh - let the fruits rot. 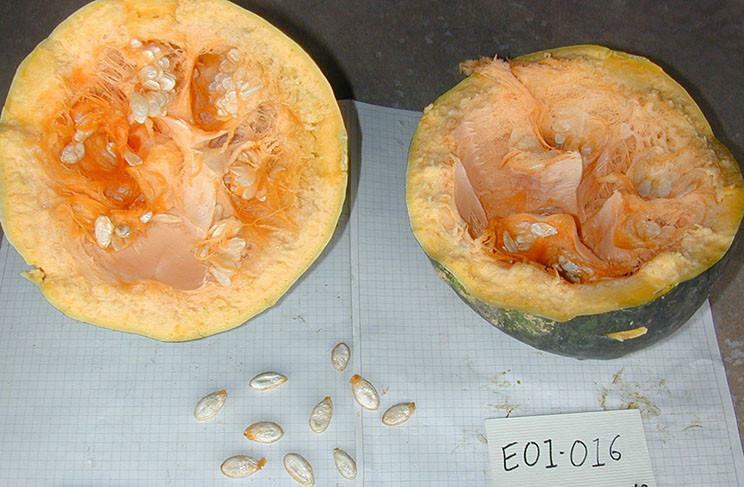 Mature fruits were large - to 20 inches in diameter, and probably 20 lbs (they have large seed cavities). I suspect the mature flesh is not that sweet, and it was pale yellow, not orange, but the texture seemed good. Lots and lots of seeds, and likely good to eat, and one of the reasons this variety is cultivated. These are long keepers too. And very ornamental with striking colors - yellow, white, and green. C. mixta (110 days) Aka 'Tennessee Sweet Potato'. 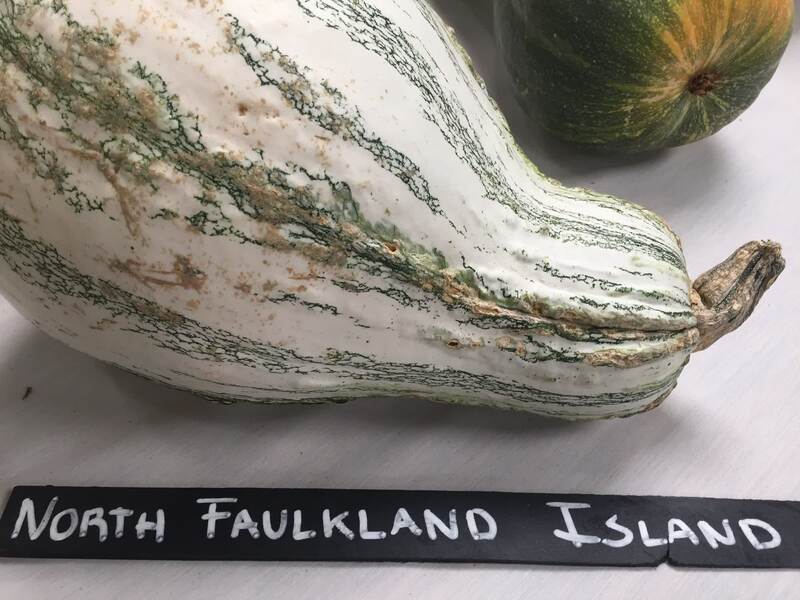 This ancient Native American squash has a storied history. 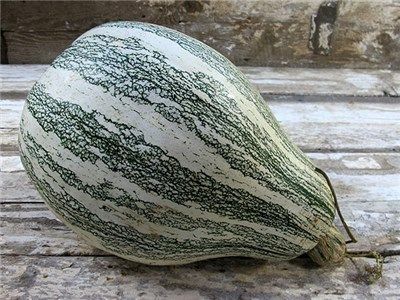 Growing to 10-20 lbs and 18" long, its fruit is bulbous and white with green stripes. The meaty flesh is slightly sweet and the fruit store extremely well - up to four months. It was a staple among the First Nations people of the southwestern U.S. and they passed it on to settlers. Even today, it is a favourite for making pies and "cushaw butter". This is a very hardy plant, tolerating high heat and resistant to the squash vine borer. 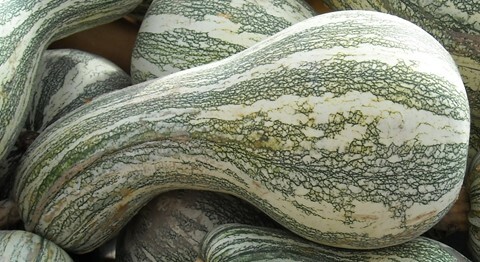 A large pear-shaped squash, white with green stripes. The flesh is yellow and very mild-tasting. The plants are productive, yielding several fruits each when grown well. 110 days.